A new Australian platform for publishing in craft and design has emerged. Garland is a quarterly online magazine that features articles from around the world with a particular focus on the Asia-Pacific. The first issue contains more than 30 articles about the thoughtful objects being made in the wider world. There are features on classic and innovative crafts in South Korea, including key voices in the new generation of curators whose challenge is to connect the traditional strengths of Korean craft skills with the contemporary world. An online exhibition Intimate Immensities casts a broad gaze across creative endeavour on both sides of the Pacific. Showing the interconnectedness of the Asia Pacific, there are also articles about Korean artists working across the Pacific, including Melbourne, Sydney and Los Angeles. From Australia we have a combination of Aboriginal and settler makers reflecting the importance of place in their work. There are parallel articles from New Zealand, India, Malaysia, Indonesia, Zimbabwe, Colombia and Mexico. The editorial team also includes Damien Wright and Olivia Pintos-Lopez. 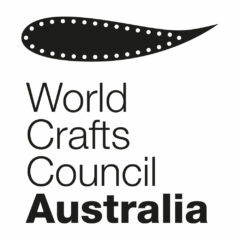 Garland is auspiced by the World Crafts Council – Australia. It has been made possible thanks to a successful crowd-funding campaign that raised three times the target amount. Each issue features a commissioned ‘slow read’ on a handmade object. The first essay is by Julie Ewington on a porcelain vessel by Kirsten Coelho. This is a masterfully written reflection on the way a ceramic artist can capture time. It is available to subscribers in web and e-book formats. These subscriptions fund the magazine. There is also a special collector’s edition with covers hand-decorated by refugee artists associated with Melbourne Artists For Asylum Seekers. Future issues will map places of creative activity in the region. The next issue will focus on South Australia. Future destinations include Yogyakarta, Canberra, Mumbai, Cairns and Oaxaca. The website is www.garlandmag.com. Subscriptions are $AUD 40. Garland magazine maintains an active focus on Twitter and Facebook.